New cooking techniques and fresh foods pave the way for a culture change in patient care. The concept of “food as medicine” is widely accepted for good reason: A nutritious diet has enormous benefits for well-being. That’s why Northwell Health has envisioned a new standard for the hospital food it serves. 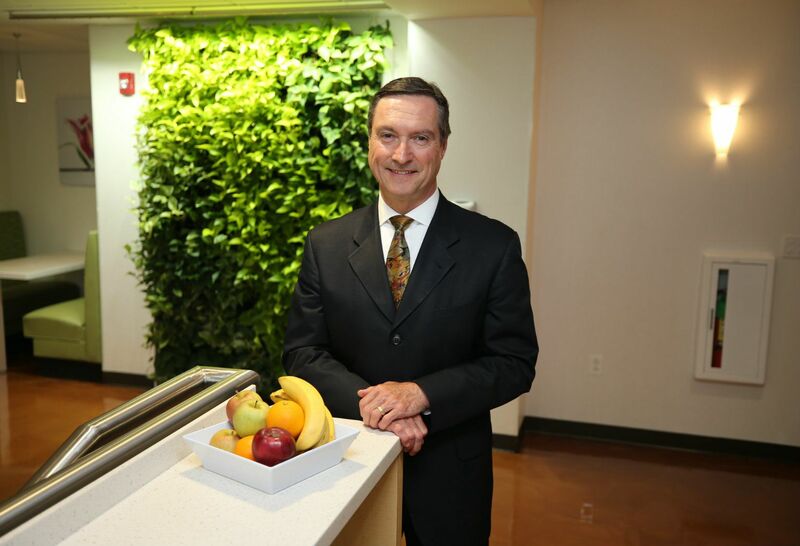 The health system has developed several initiatives to improve its food and nutrition offerings — the centerpiece being the December 2017 recruitment of Bruno Tison, vice president and corporate chef at Northwell. He joined the health system after decades in the hotel and restaurant industry, and is the first and only Michelin Star chef hired by a U.S. healthcare organization. This article appeared in the latest issue of The New Standard. He and his team have recruited talented chefs, trained staff and standardized menus. Mr. Tison said about 80 percent of the health system has transitioned to buying fresh food, and he recently signed on with three artisanal bakeries to offer fresh bread at all Northwell hospitals. “Food can heal people. We are working to get fresh chicken, fresh burger and fresh coffee,” he said. “We removed the deep fryer from the kitchen. The chefs can only buy fresh fish. Salmon has to be organic. We’ve got a lot of things in place.” Northwell has also eliminated sugary drinks, candy and ice cream at its facilities. Food can heal people. We are working to get fresh chicken, fresh burger and fresh coffee. We removed the deep fryer from the kitchen. The chefs can only buy fresh fish. Salmon has to be organic. We’ve got a lot of things in place. There’s one thing Mr. Tison doesn’t mind burning: shoe leather. Since food hasn’t historically been top priority at hospitals, he hit the road to change some minds. For two months, he visited all Northwell hospitals to evaluate kitchens, meet with staff, build relationships and demonstrate fresh-food cooking techniques. He also established a monthly Chef’s Council. The initiatives have improved morale and expedited culture change, he said. Recruiting talent is also a priority. The nationwide chef shortage in the restaurant and food industry is an opportunity to promote health care as a viable career option, Mr. Tison said. He’s already working with the Culinary Institute of America to provide externships at Northwell facilities and potential full-time positions upon graduation. “We are changing the way people are thinking about food in the health care field,” Mr. Tison said, adding that Northwell chefs are already showing a lot of improvement. Data influences just about every professional discipline, including food service and delivery. Each week, Mr. Tison monitors patient experience scores in system-wide scorecards on the Employee Intranet. The data allow him to drill down to food service at each hospital, on each floor and in each unit. He has already seen progress. The health system is piloting in-room dining (room service) for 230 beds at North Shore University Hospital, with the goal to offer it for all 820 beds by January 1. Mr. Tison is reworking menu and kitchen designs, and plans new uniforms and new china. Nutrition profiles will continue to improve by switching to unsalted butter and offering healthier deserts and never-fried French fries. “It’s very rewarding to see the improvements that are just starting,” he said.